Radiation therapy is a form of cancer treatment that is most helpful for tumors with a low rate of metastasis (spread to other organs) that are confined to one area of the body. Radiation therapy is similar to shining a beam of light; only the tissues that fall within that beam receive treatment. For some pets, their cancer can be cured. In other instances, radiation can be used to palliate and relieve pain or other effects from a tumor. Oncologists recommend radiation therapy for patients when surgery is not an option or would result in unacceptable side effects. Radiation therapy can also be utilized in conjunction with surgery if the entire tumor cannot be removed. 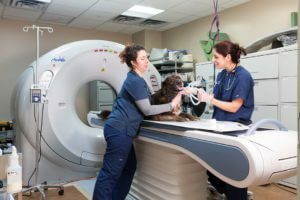 The optimal timing for radiation therapy is specific to each pet and requires careful consideration by the oncologist and the surgeon. Radiation therapy cannot be given in one large dose without causing complications to the normal tissues. Therefore, this therapy is administered in small doses over multiple daily treatments to give the best chance of tumor control while minimizing damage to the normal tissues. A unique treatment plan is made for each patient based on tumor location, tumor type and the goal for treatment. Palliative protocols require fewer treatments given on a more flexible schedule. Because patients must remain perfectly still during each treatment, they must be put under anesthesia. Although there is a small risk associated with repeated anesthetic events, each patient is monitored very closely during his or her treatment. In addition, only short-acting anesthetic drugs are used to minimize side effects and to allow patients to wake quickly. The area that is treated with radiation includes the tumor and a margin of tissue surrounding it. Side effects occur only in this treatment field. Some changes are expected during and right after the full course of treatment, such as hair loss and irritation of the skin or other tissues. For each patient undergoing full course radiation therapy, we expect to see some degree of these effects. However, these effects are temporary, and we expect to be able to alleviate any discomfort a patient may experience. Some changes are not expected to develop until months or possibly even years after completing the full course of treatment. Our protocols are carefully planned to try to avoid any late-occurring side effects. Because the goal of palliative radiation therapy is to improve a patient’s quality of life, it rarely causes any detectable side effects.